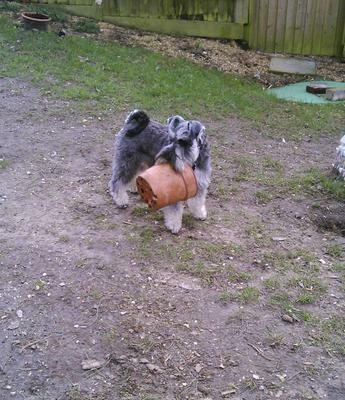 I can carry empty plant pots.. !! I always nearly catch my Frisbee.. Yes those black ones ..
Hi again.. it's me, Benji.. I think it's about time I showed you all how good I am at gardening.. mummy empties the plant pots and I carry them around.. I also love my Frisbee and nearly always catch it.. 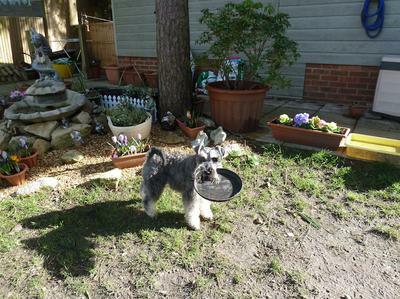 Sometimes with the empty plant pots I get fed up so I throw them behind me.. to play with later. !! After this post I will let mummy post another little story and photos, too, of me & my two pals Rambo and Rebel.. in her daughter's garden..
What a clever boy Benjy is, Michele -and you are so lucky to have him help you with the gardening. 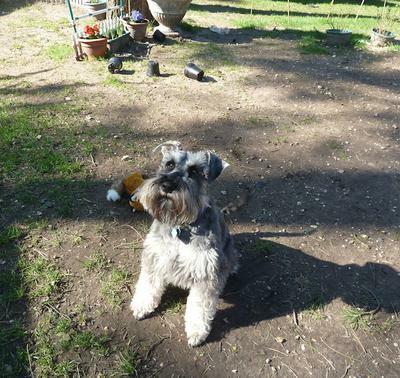 I wish I could train Max to do that, instead of him running Schnauzer circles on the lawn and tearing it up with his teeth!! Linda, I forgot to put my name in the box.. the Anonymous is me.. Michele or did you miss it out on purpose.. !! I doubt it.. Thanks and as you see Linda, there is no grass hardly at all for Benji, nor Rambo & Rebel to tear up.. it doesn't grow due to the five pine trees .. the needles and the cones are a nightmare. I've not a problem, but they do chase one another like mad.. Benji does dig holes.. !!.. no Comment as Benji will eventually post a couple..
Max likes to pull up our lawn with his teeth when he is running schnauzer circles - he is not averse to the odd dig, either.